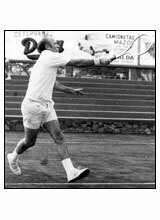 Mike Franks won the World Maccabiah Games’ Tennis Doubles championship in 1961 and 1965. The UCLA star was the #2 ranked USA intercollegiate player in 1956, the same year he also won the United States National Hardcourt Doubles crown and was a member of the U.S. Davis Cup team. All-America 1957-58, Franks reached the Wimbledon Doubles quarterfinals in 1957, and held a #2 ranking on the United States Team. In 1959, Mike was ranked #7 in U.S. men's singles, and was the only person to defeat Wimbledon singles champion Alex Olmedo over a period of six months. In 1951, he captured the National Boys' Doubles Championship and, in 1953, was ranked the #2 Junior in the country. Seeded the #1 Junior in 1954, Mike won the Southern California Juniors singles championship.